Nuit Blanche ("White Night") is an annual, all-night, or night-time, arts festival that started in St. Petersburg, Russia. I was lucky enough to be in Paris in May 2007 during their Nuit Blanche, and the museums stayed open until the wee hours of the morning offering free admission, concerts, and other special events. I remember the thrill of strolling the streets of Paris at midnight, surrounded by other arts lovers, including families with children, and thinking how magical it all was. 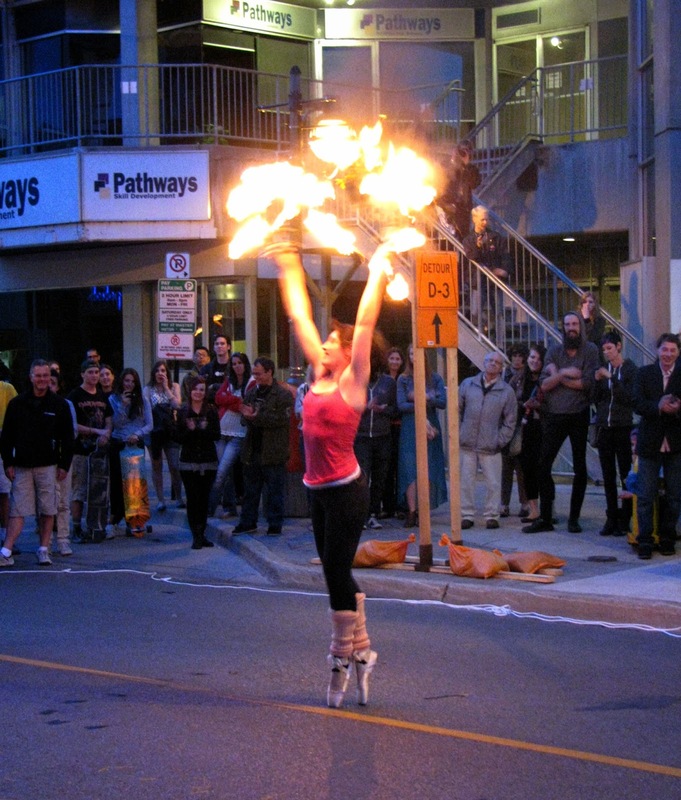 Nuit Blanche has since been adopted by cities all over the world, and in 2010 even little old conservative London, Ontario adopted the tradition, in conjunction with the London Fringe Festival. 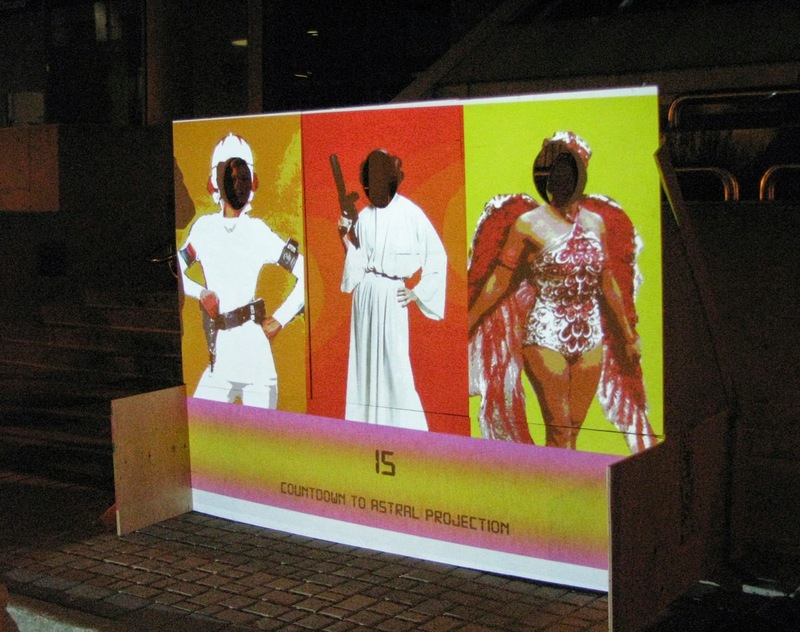 Unfortunately, our Nuit Blanche tends to be on a much smaller scale than those in larger cities like Toronto which has support from the city and corporate sponsors. 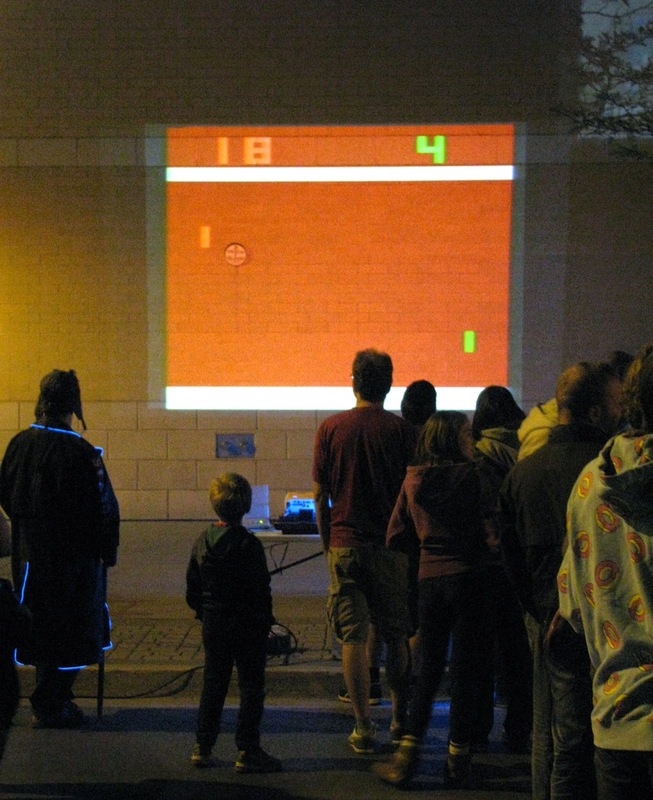 There's no financial support here for the one night event, so it is up to local artists and performers to put on a show using their own creativity and resources. It was still light out when I got downtown, and this was the first thing I saw. 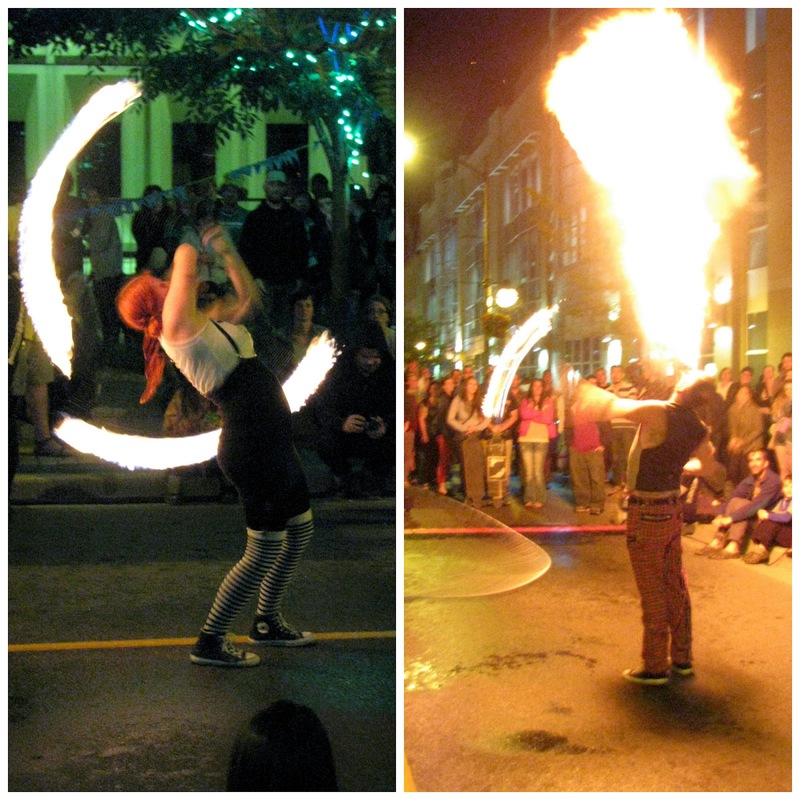 It seems that during Nuit Blanche, all the rules about playing with fire go out the window. 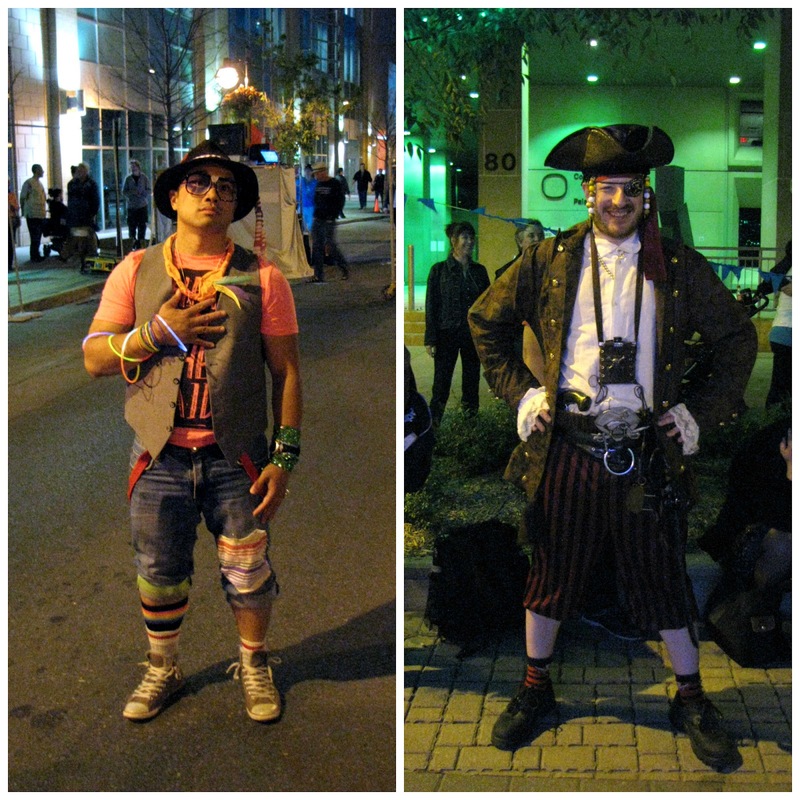 The Arts Project was hosting "Visual Fringe" featuring the works of 25 local and area visual artists. 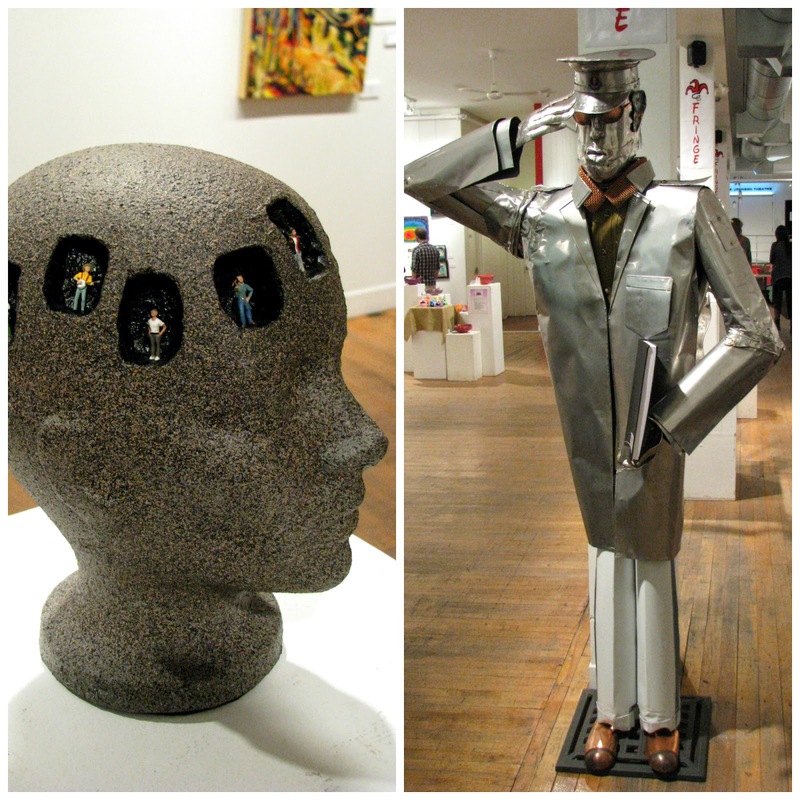 Above left is "Compartmentalize" by Cora Linden, and on the right is a metal sculpture by Jerry Vrabec. Museum London, which is the largest public art gallery here in London, always has events scheduled during the evening including art-making sessions, films and music. I preferred to stick to the street and discovered a new gallery space on Dundas Street called DNA artspace, where an installation created especially for Nuit Blanche by Canadian sculptor John McEwen was on view. 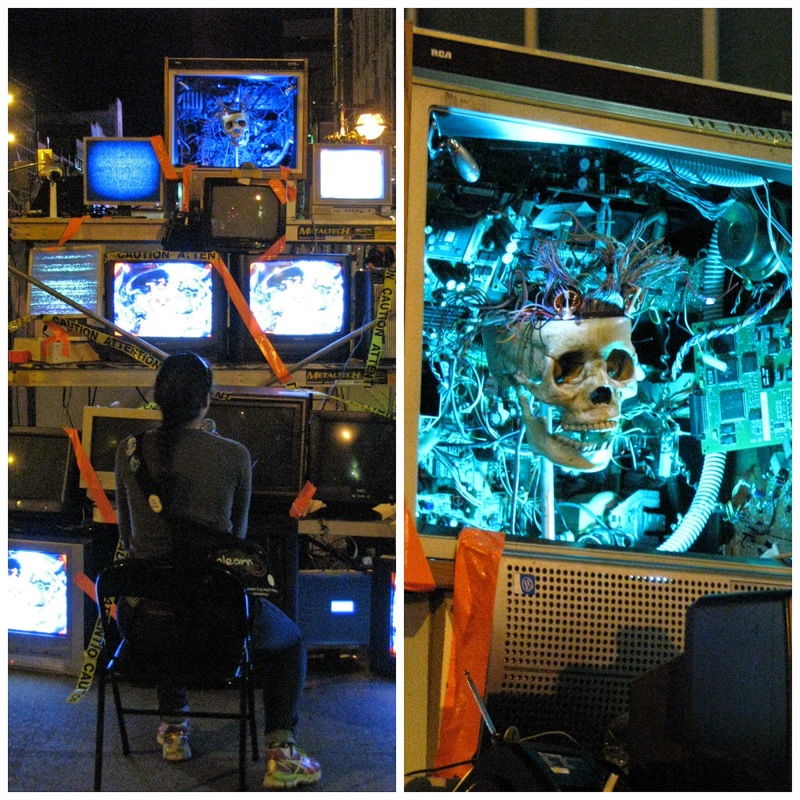 McEwen's installation was part of an exhibit titled "Beauty Beneath the Bone" which is part sculpture and part video. McEwen is best known for his sculptures that depict Canadian wildlife, and the bear in the photo above is constructed of laser cut metal stars and other celestial shapes. 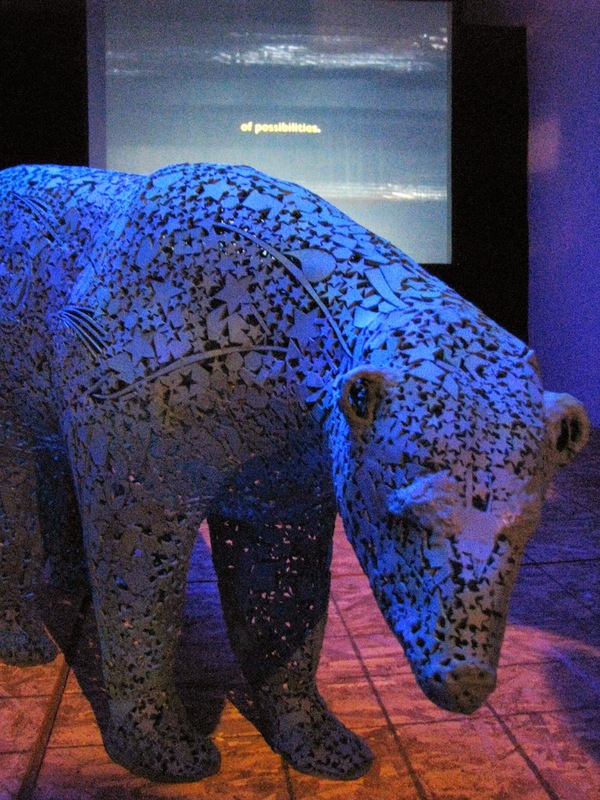 The bear could be seen from the street through the open doorway of the gallery and its glowing blue presence drew people in for a closer look. McEwen's show continues at the DNA artspace until August 13th. 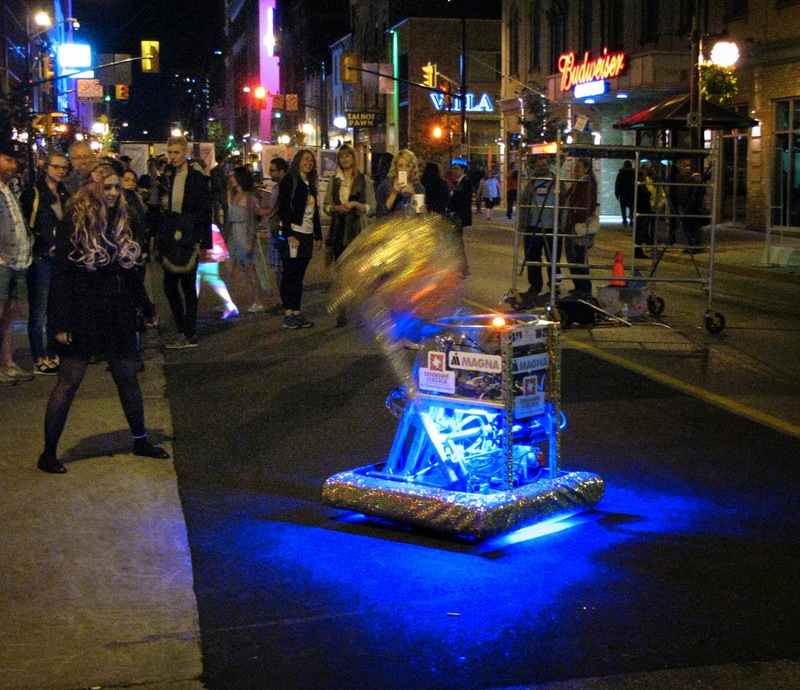 A new addition to Nuit Blanche this year was the Retro Electro Sideshow, the creation of Uber Cool Stuff in partnership with UnLondon and various other creative folks in town. 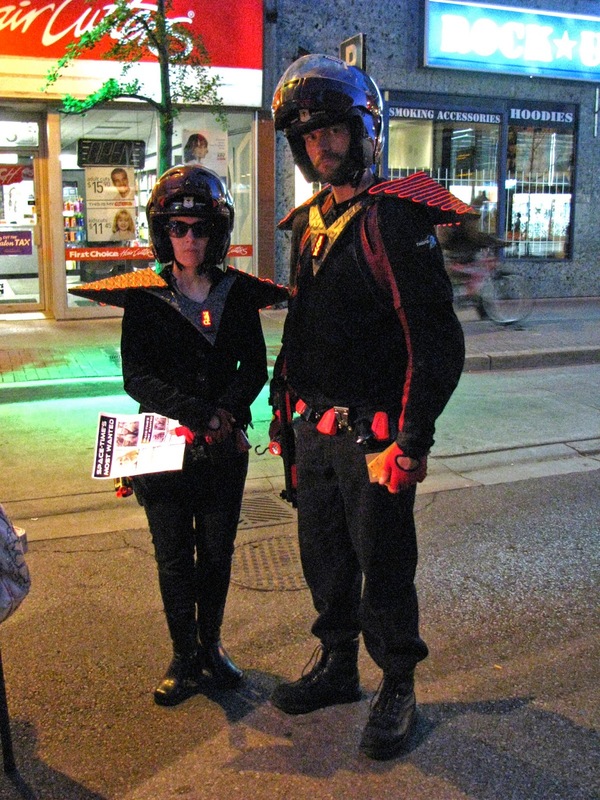 Billed as "a crazy collection of contraptions and contrivances constructed to engage, amaze, and amuse the milling masses", this sideshow took over the block on Dundas between Talbot and Ridout and delighted viewers with a mix of interactive old-school video games, robots and a carnival style sideshow. When I asked the skull if my blog would bring me fame and fortune, she (as it was apparently female) said that it already had, as she even knew about it, and she was from another dimension. I then asked about the "fortune" part, but she didn't have any answers for that one. There was some very cool fire play performed by (left) a sassy redhead whose name I didn't get, and (right) Chris Campbell (aka FenyxFyre). 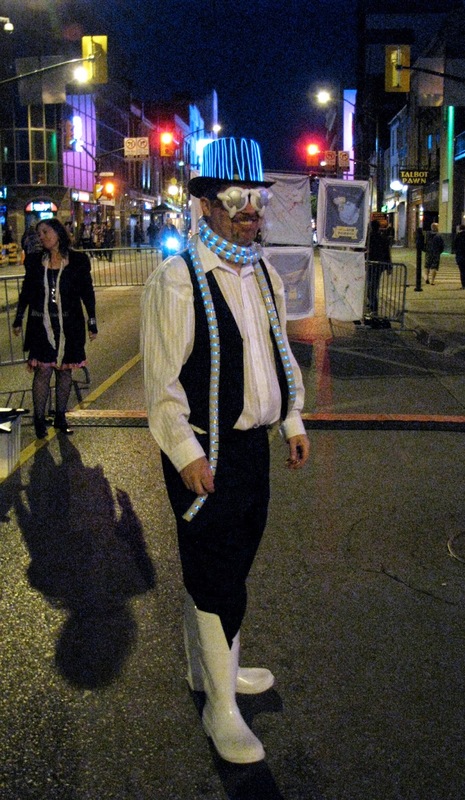 The Retro Electro Sideshow was a welcome addition to Nuit Blanche and I was impressed by the creativity and hard work that went into creating something that was enjoyed by all ages. I can't wait to see what Mr. McInnis has up his sleeve for next year. Wow, how cool is that? I love cities at night. The freaks come out at night and I'm one of them! This is killer! See all the cool stuff you do! I would be all about the interactive stuff and I would have loved to get dressed up or light up should I say. The bear sculpture needs to be in my garden now! such a cool event, everything looks so interesting, the name itself is great, Nuit Blanche sounds really evocative! Wow... What a great list. It's no wonder that some of these are the top blogs. I have never even heard of some of them, but what truly great ideas. It just goes to show you that people enjoy ideas outside of the box. Hopefully in the future I can create a web host that is half as successful. Wow! That's some waaaaaay cool stuff! 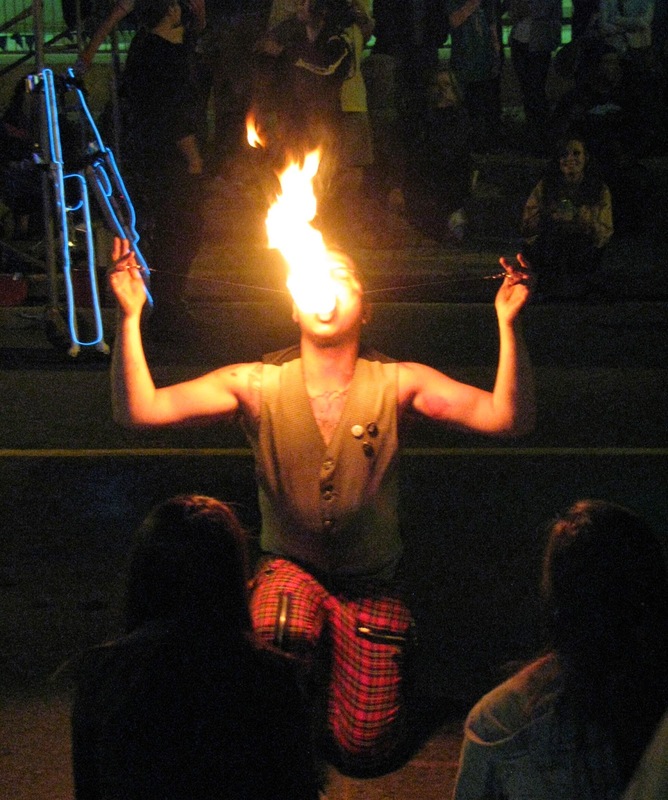 My faves have to be the - um - what's the professional term - fire eaters? firewalkers? fire slingers??? Think how much steely concentration it takes to do that right (and en pointe, no less). My question: where do they practice??? Fabulous! And great pictures!! !